When Robbie and I visited New Ulm a couple weeks ago, we kept trying to put our finger on what it was about their downtown’s main drag (Minnesota St) that made it seem not as attractive as Northfield’s downtown main drag, Division St.
We both noticed that New Ulm’s downtown street was much wider, easily accommodating diagonal parking on both sides, inhibiting the feel of an ‘outdoor room.’ But then it dawned on me that there was another factor: the lack of a ‘terminated view’ that Bridge Square provides. I learned about both of these design elements from former Northfielder Chris Robbins who wrote a column about both for the Northfield News back in 1999. Here in Vermont we are used to the terminated view. 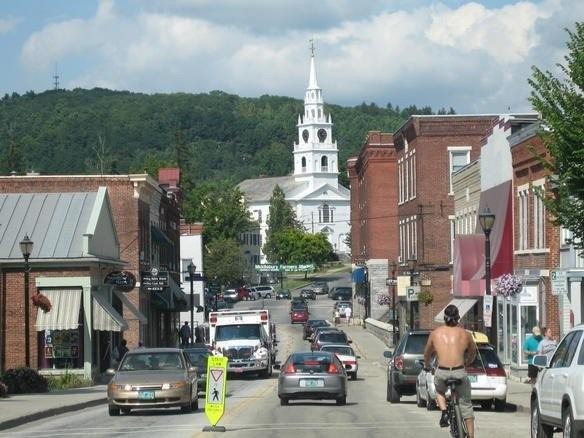 For example, here is Middlebury’s Main Street. The bridge you can see here is the only bridge within miles except for an old covered bridge. So it takes all the semis as well as other traffic, but it still functions as a popular pedestrian street, partly because it’s so narrow and easy to cross. Discussions about a bypass or a second bridge have been going on since the 50s, but nothing came of them. So the town decided to build a second bridge themselves, without state or federal $. It is under construction now, funded by a sales tax and a rooms & meals tax that we voted for. It’s not far from the current bridge, but it will provide a short-cut to Rt. 7 (our equivalent of Hwy 3). Considering that the police and fire depts. are on one side of the river and the college and hospital are on the other, it does seem about time for a second bridge! And although Middlebury has a pretty Main St. with a terminated view, we don’t have anything as nice as Bridge Square. At a conference I attended recently, an internationally known architect mentioned that when he goes on vacation with his family, he pays his son to measure streets, sidewalks and buildings. I found myself doing the same thing once in Madison, WI, measuring the streets and lawns in my sister’s neighborhood with a tape measure — and since then I have done it in other places. Why are we doing this? It is a way to better understand why certain areas are well-loved and successful. Neighborhoods, public spaces and civic buildings that have endured for decades as places that attract and delight people are being studied to see if patterns emerge that can explain their success. Patterns have indeed emerged, and I am going to discuss two of them in reference to Northfield. The first pattern, one that I was excited to discover because it explains so many places that I like, is the “outdoor room.” Urban researchers have discovered that an outdoor space with enclosing walls the right distance apart can create a sense of coziness, comfort, and belonging, and will cause people to seek out those spaces whether or not they can articulate the reason. An outdoor room is created if the distance between the “street walls” (building walls facing the street) is between 3 and 6 times the height of the walls. The closer distance is generally more effective. The well-loved neighborhood that I measured in Madison (dating from about 1900 through the 1920s) fits the model of the outdoor room. It has a 28 ft. wide street; 4 ft. blvd., 5 ft. sidewalk, and 19 ft. setback to the front porches. Total: 84 ft. Most of the houses are two stories with full attics, so they are about 30 ft. tall. The ratio is about 1:3 plus or minus, depending on whether you measure from the porches or house fronts. It is easier to create outdoor rooms with taller buildings, but I have seen places in California where one-story houses are grouped around courtyards (bungalo courts) to achieve the same effect. In Northfield, Division Street between 2nd and 6th Sts. provides the enclosed feel that is so noticeable when you enter this area from either direction. The relatively narrow distance from street-wall to street-wall – about 73 feet – makes it possible to recognize and call to a friend on the other side of the street. This distance is within the 85 feet that you can be from another person and still see his or her eyes. In our residential areas, current standards call for 66-ft rights-of-way (including 36 ft. of pavement), and 30 ft. front setbacks. Total: 126 ft. from the wall of one house to the wall of the house across the street. Two-story houses can create a relatively wide outdoor room here – and street trees can help – but it would take houses four stories tall to produce a ratio of 1:3 like the street in Madison. The second pattern I would like to talk about is the terminated view. This is a well-known principle that has been used to great effect in Europe, where streets are often terminated by a cathedral or public building. It was forgotten for a time in the U.S. when the grid system was imposed with rigid regularity on every town. Looking down a street forever until it vanishes to a point on the horizon is not as satisfying as seeing an attractive building or monument in your view. Northfield has the good fortune of having a kink in Division Street right at Bridge Square, so that travelers have a view of the fronts of the buildings in the next block. This makes a tremendous difference between our town and so many others in the Midwest. Raymond Unwin, an American planner from the early 1900s whose book, Town Planning in Practice, has recently been re-published, observes that the most effective plazas and squares are those that are enclosed. When you enter the plaza, your view is terminated by buildings; the roads exiting the plaza are hidden or offset so that you cannot see down them. Bridge Square has this quality due to the kink in Division Street and the angle of the 3rd St. bridge. The Ames Mill is fortuitously placed across the river so that it terminates the view when entering from E. 4th St; it is also tall enough to act as one of the “walls” enclosing the plaza. This creates the unique effect of actually having a river that is visually inside a plaza. Bridge Square also functions as an outdoor room. Its small size allows it to feel enclosed by the surrounding buildings. When students of cities go out to measure special places, they measure places like downtown Northfield. It has magic, but that magic is not a complete mystery. We can use the principles that make it special to create new spaces that will also attract and delight people. 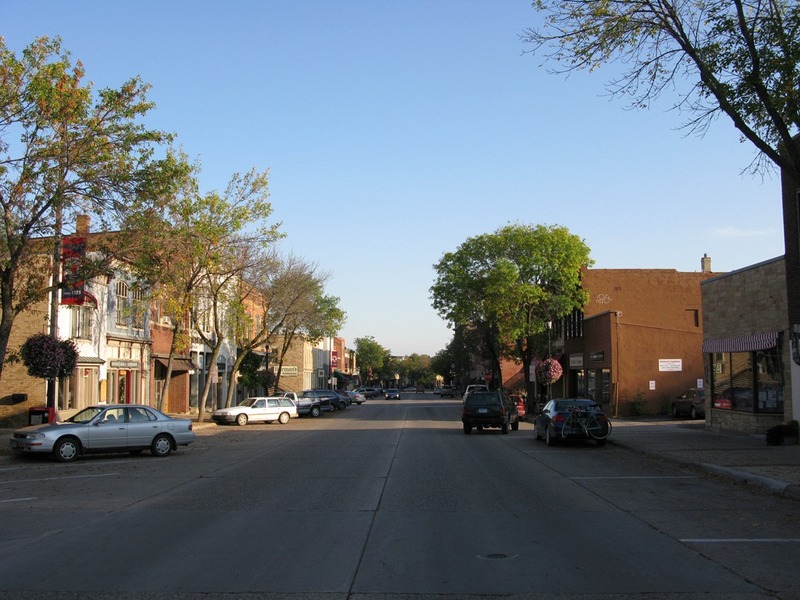 The trees and the flower baskets on Division St., as pictured above, also go a long ways towards softening the view of Northfield’s downtown, as compared to that of New Ulm. Good point, Patrick… the large trees, especially, because they add to that ‘outdoor room’ feel in places. I’d also forgotten about her observations about the angle of the 3rd St. bridge, the position/height of the Ames Mill, the ‘outdoor room’ of Bridge Square. The way the sunlight hits the streets is also key.